A child’s world is full of input that needs to be identified, sorted, organized, and eventually understood. The activities in the Sensorial area focus on how the brain processes data from various sensory modalities, the most basic of which include the five classic senses of vision (sight), audition (hearing), tactile stimulation (touch), olfaction (smell), and gustation (taste). In Sensorial, Montessori children work with their senses, both in isolation and in conjunction, to complete various lessons that grow increasingly difficult over time. The Sensorial area is home to some of Montessori’s most recognizable and ‘iconic’ lessons. 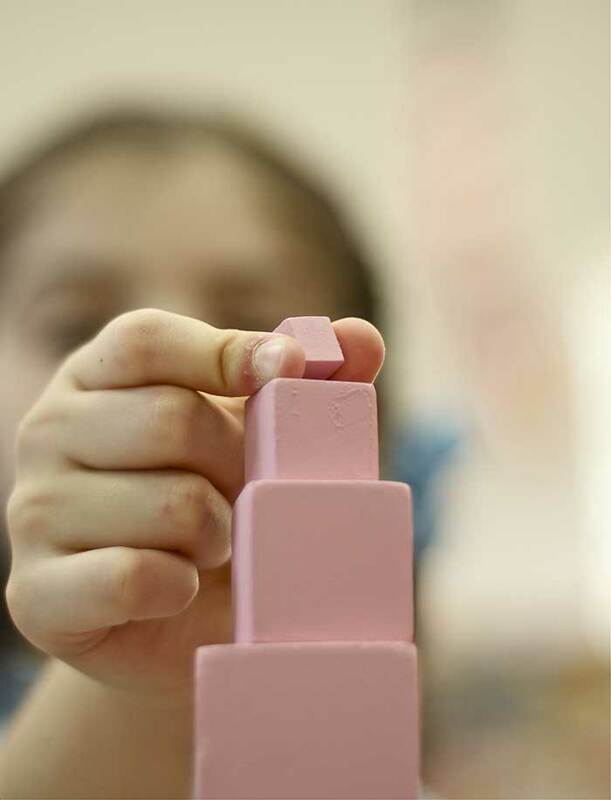 Materials such the Pink Tower and the Brown Stair help the child learn how to process sensation and use one’s body more effectively within the environment. Specifically, the Sensorial area helps children turn their senses into increasingly effective and reliable tools for gathering and interpreting information. The skills developed here impact every activity that we encounter in the classroom – and life itself – and are essential for comprehending our surroundings. The purpose and aim of Sensorial activities is for the child to learn to acquire clear, actionable information from the environment and then to make decisions based on that information. Dr. Montessori believed that sensorial experiences begin at birth and recognized that the senses play a fundamental role in the development of a child’s intellect. She created the Sensorial area to aid children in the development of their reasoning skills and to stimulate their growing intellect. Where Practical Life helps children to acquire skills needed to physically control the objects in their environment, the Sensorial area adds a more cognitive component as children now begin to bring order to those objects. Given such, the sensorial materials serve as a scientific guide for children to clarify, catalogue, classify, and order the impressions of their environment. The goal of sensorial activities is not simply to provide children with sensory experiences, but instead to isolate one sense and highlight specific qualities, or attributes, that encourage children to refine and strengthen their use of that ‘isolated’ sense. The Long Rods, for example, engage the visual sense and focus on the attribute of length. The rods are all the same color and the same width; the only variable is length. As children physically manipulate each rod, they get a clearer impression of this quality. Gradually, in time, they come to develop what we call a “motor memory,” which is a knowledge or understanding based on one’s physical and sensory experience. Can assist adults in the early detection of defects in the function of a child’s senses. Dr. Montessori designed sensorial exercises to stimulate our ability to perceive through our senses and categorized them into eight distinct groups: visual, tactile, baric, thermic, auditory, olfactory, gustatory, and stereognostic. Unlike those in the Practical Life area, the materials in the Sensorial area are not ones that are familiar or recognizable from everyday life. Instead, they are specially designed for the Montessori child. In truth, Montessori’s materials for the Sensorial work came from her own observations and from ideas and materials from the French doctors Itard and Seguin. Unlike the material used for Practical Life, this material has either never been seen or never been used by the child in his everyday life. Sensorial material is not something children have preconceived notions about, but is rather something “new” for teachers to introduce. Accordingly, the material is carefully presented in a specific way or in a specific pattern: the child learns to match the similar things, then he is shown how to grade the material based on its quality, and then he receives the language related to his work. They isolate one quality that is to be worked with. They have a ‘control of error’ that allows children to make the corrections themselves. They are simple in appearance and esthetically pleasing. This is intended to attract attention to the objects and allow children to manipulate the materials with ease. They must, by design, be ‘complete.’ A child who is working with sensorial material must be able to ‘complete’ the lesson without having to stop and find a missing piece. They are limited (in multiple senses of the word). Sensorial materials are limited in that there is only one of each lesson in the environment and limited in that not all of one quality or piece of information is given to the child. The child is not given every color in the world, but only a select few. This gives the child the keys to the information so it peaks his curiosity and leads him to learn more out of his own interest. They are all what Dr. Montessori referred to as “materialized abstractions.” Each material clearly and concretely demonstrates abstract mathematical concepts, such as diameter, height, width, length, area, and volume and are often organized according to a base-10 system that will be further explored in the Mathematics area. The Sensorial area is Montessori’s home to exercises in perception, observation, fine discrimination, and classification that play a major role in helping children to develop logic and concentration.